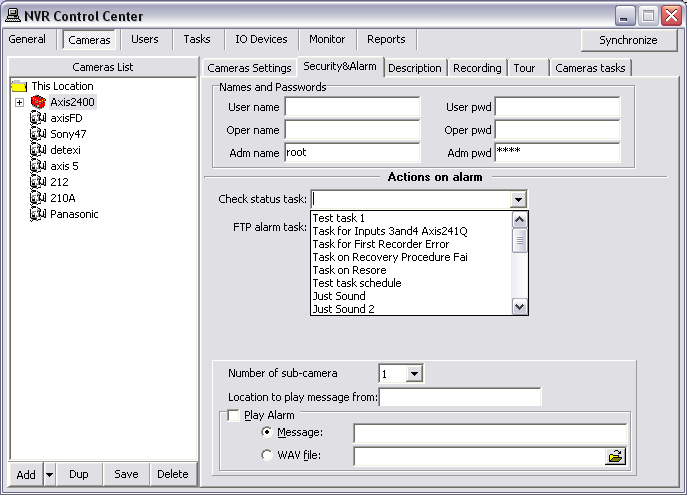 To monitor the health of the DETEXI software components (services) you need to assign a task (action/notification that will be executed in a case of failure) to each component you wish to monitor. Assign a task to each system component you wish to monitor. The Check Alive service is relatively heavy on NVR resources and it should be used only in the case of recording on I/O ports when the recorder is off and starts to record when the signal from I/O port is received. Go to the Recording and switch to the Schedule side tab. Select a schedule from the Schedule list to update an existing schedule settings or press Add button below the Schedule panel to create a new schedule. To make it easier a template enforcing particular settings in a newly created schedules can be created. 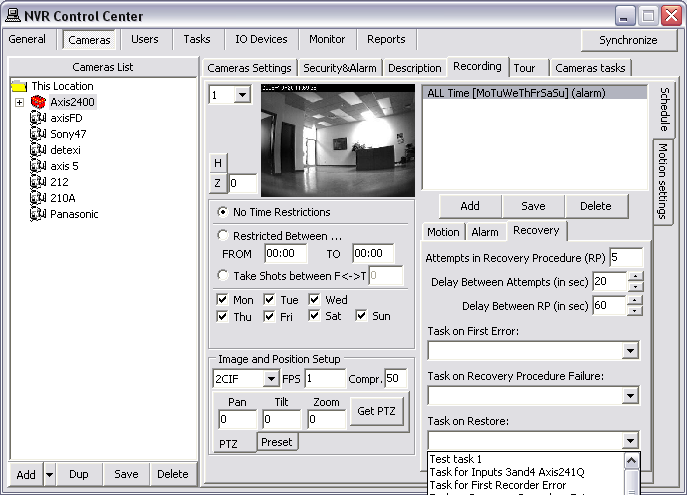 The Recovery Procedure settings from this template will be forced in to each newly created schedule and could be changed. There are some problems that should not be tolerated. If the tasks associated with them are initiated you have to seriously reconsider your NVR settings and/or the hardware you are using. The Writing error task initiates when the Recorder fails to record streaming data on the hard drive. It could be because of a hard drive error, a Windows error or the Recorder could not do its job because of lack of resources (usually an underpowered CPU). The Drive limit reached task initiates in case of free space for the system files or free space necessary for NVR functioning becomes too low. In some circumstances the Recorder service could even be stopped because the NVR cannot manage the given amount of information due to a lack of system resources. In this case you should reconsider your IP-devices Recording Schedule settings and /or Keep information for parameter and/or your hardware configuration. In order to get advantage of getting notification/action in case of any of the catastrophic errors occurs you must setup the Writing error and Drive limit reached tasks. The purpose of the NVR Status task is to send out the current NVR status of the NVR components at predefined time. 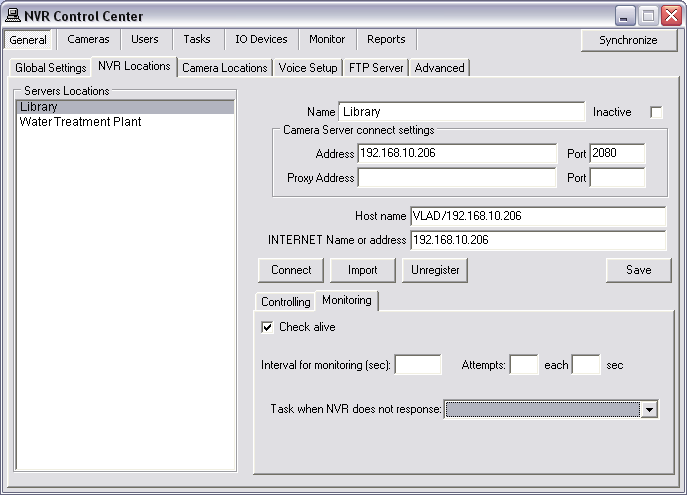 The NVR Status Task is initiated once a day at a predefined time and provides the user a list of the NVR components being monitored and their status. Although every NVR in the NVR Domain Controller configuration should have its own reliability settings there is a new intercommunication layer between the NVR Domain Controller and a child NVR, which could also fail and therefore the system administrator must be able to check its status. To be aware weather a child NVRs are alive and properly respond to the NVR Domain Controller you should setup the Task when NVR does not respond for each child NVR in the NVR network (domain). Switch to the Monitoring tab and input your setting to define an Interval for monitoring (sec), number of Attempts and interval between them. Check Check alive check box.